Small flashback, some of you probably heard this story before and for some maybe it's new like it was for me week ago, so I'd like to tell you. Back in 1994 Bond series has got its continuation with new film "GoldenEye", new James Bond - Pierce Brosnan and sure new soundtrack was also required. Obviously everytime loads of huge names around the world are struggle for their songs to become Bond soundtracks and that time Ace Of Base was one of them writing the song "GoldenEye", vocals were provided by Meja (though you can find information about AOB's backing singer Jeanette Söderholm-Von Der Burg performing it but our trusted friend Jules revealed that Jonas Berggren told him directly it was Meja) and production was made by John Ballard, StoneStream and Ace Of Base. 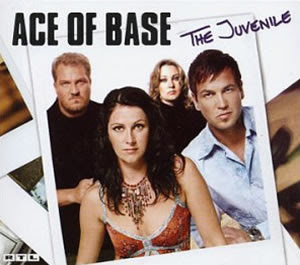 Year before Ace Of Base has just released debut super-successful album and it has become a problem, Arista Records (American label of Ace Of Base) has decided not to go to this risk as new Bond's film after 5 years of break could become a flop draging Ace Of Base down as well and the demo hasn't gone further. Finally movie and soundtrack from Tina Turner have become huge hits and lyrics of Ace Of Base's "GoldenEye" was re-worked to a new version called "The Juvenile" - song that was released in 2002 on fourth album "Da Capo". Below you can listen both versions of the song. Thanks so much Jules! I trust you so I've edited post and with Meja's name involved it all gets even more exciting :) How interesting she's become next big export-star from Sweden after this collaboration. Nothing can be 100% obvious in this world ;) Being Meja I'd mention it more in offical biography stories. Jesus!!! I was drunk, temporarily crazy or it wasn't me at all!!! Sneak peak of new Roxette's album "Charm School"
E-Type's new single "Back 2 Life" has arrived! Gott Nytt År!!! Happy New Year!!! Copyright © Swedish Stereo. All rights reserved.